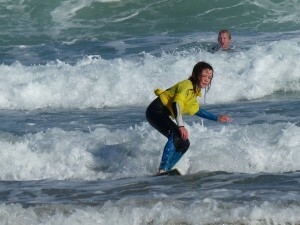 Group 1a Nemo: Surfer of the summer-Grace Harry. 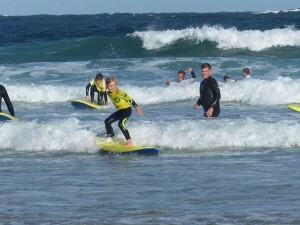 Most committed surfer – Scout Foreman. 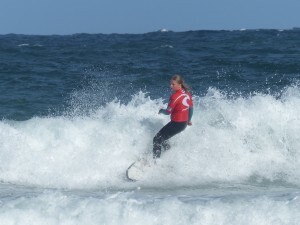 Most improved surfer – Lorena Dove. Wave of the day – Amelia Saint. 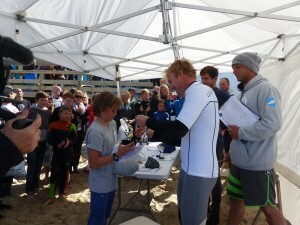 Group 1b Dory: Surfer of the summer – Teddy Nichols. 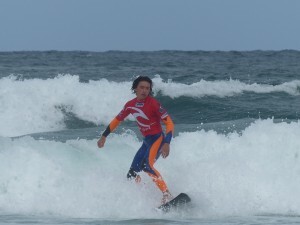 Most committed surfer – Jack Devenny. 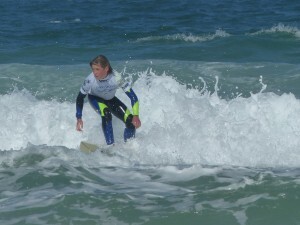 Most improved surfer – Senara Beeson. Wave of the day – Evie Stattkus. Group 2a Sardine: Surfer of the summer – Scarlet Thornton.Most committed surfer – Kaitlyn Borghi. 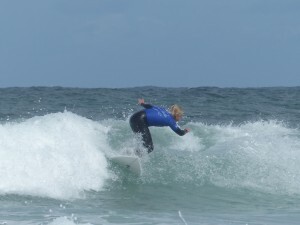 Most improved surfer – Rosie Thomas. Wave of the day – Levan Murley . Group 2b Mackerel: Surfer of the summer – Aefie Harvey. 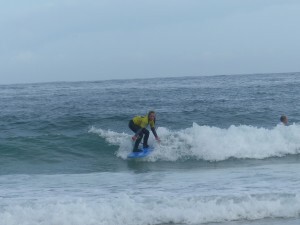 Most committed surfer – Sofia Hosking. 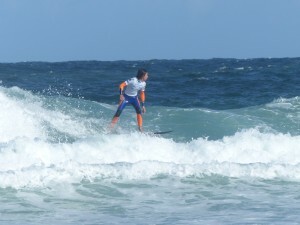 Most improved surfer – Miles Morton. Wave of the day – Kaiyan Wilson. Group 3. 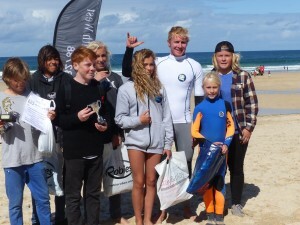 Sea Bass: Surfer of the summer – Alexander Hosking. 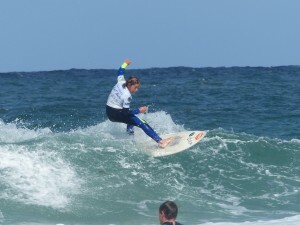 Most committed surfer – Kaya Stattkus. 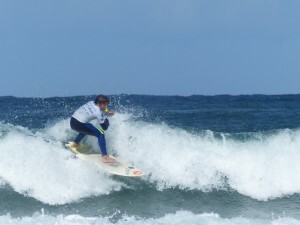 Most improved surfer – Kieran Stattkus. Wave of the day – Adrian Botterell. Group 4 Tuna: Surfer of the summer – James Marsden. 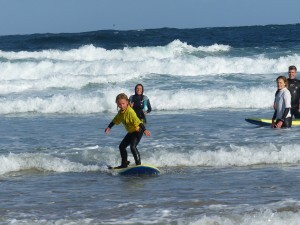 Most committed surfer – Lamorna Pascoe. 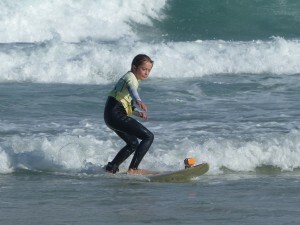 Most improved surfer – Tallulah Bull. Wave of the day – Molly Cross. 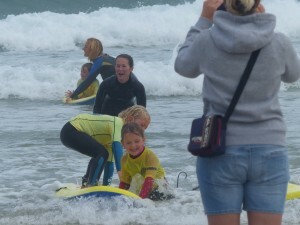 Group 5 Seals: Surfer of the summer – Hollie Nicholas. 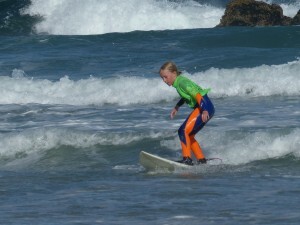 Most committed surfer – Piper Quick. 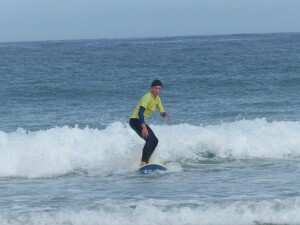 Most improved surfer – Akhil Pulley. Wave of the day – Hollie Nicholas. 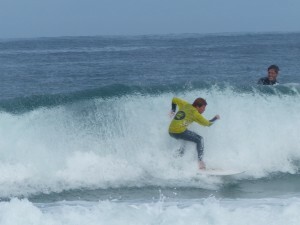 Surfers in the advanced groups took part in the more familiar contest in heats of four surfers, top two progressing to the next round. It was a new experience for most of them to pull on the coloured vest and compete under international rules – but they were quick to appreciate what was required, and some tightly fought heats ensued. The grand final was a shoot-out among the Sharks. Twice champion, Josh Martindale found some good left-hand runners early in the final and seemed to be establishing a rhythm. 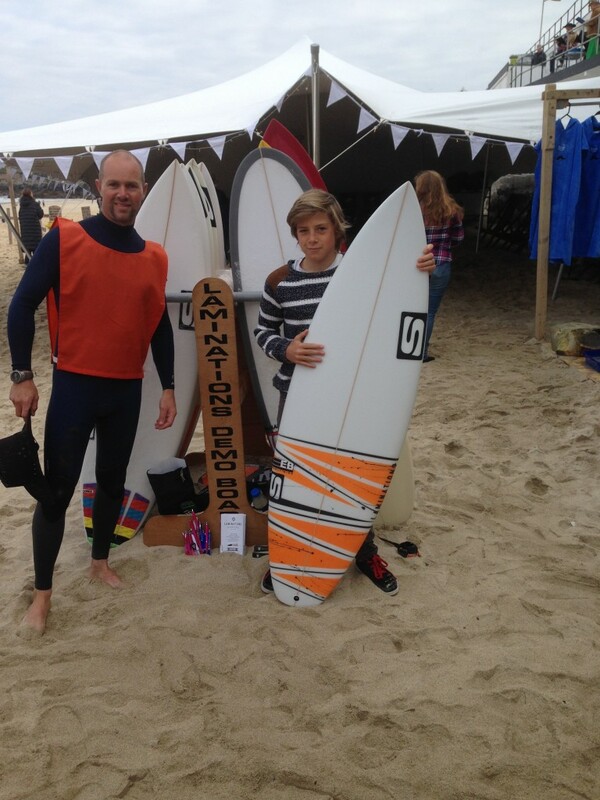 Matt Burrell had a couple of promising waves which needed stronger finishes to excite the judges. Taylor Bairds challenged with some frontside hacks on a long runner but couldn’t find that slashing rail grab finish that had earned him an 8 point ride in the semis. And the fourth finalist, Dylan Cole was meanwhile quietly building house with a variety of manoeuvres – particularly one long frontside floater with an airdrop into a smooth bottom turn into a re-entry with a clean finish. After the horn had sounded to end the final, there was some serious checking and cross-checking of scores among the judges before it was announced that Dylan had taken the title by a mere half a point over Taylor’s challenge. 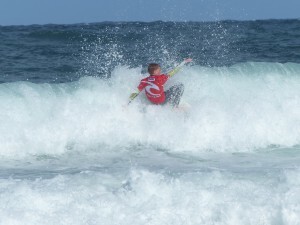 It was a fitting result in a close-fought final that was a pleasure to watch – and it earned Dylan the major prize of a custom-built surfboard courtesy of Laminations! 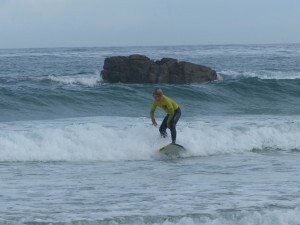 Though it was an all boys final, there had been some committed surfing by the female competitors in the previous rounds. Charley Fox won the accolade of being the highest finishing girl, followed by Eleanor Hewlett, Brigit Wells and Tara Langley in the minor positions. 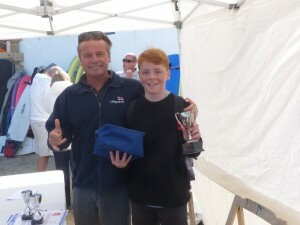 RNLI Lifeguard Supervisor, Lloyd Davies was on hand to present the trophy for the club member who had done most to help the lifeguards at Porthmeor this summer – and that went to Matt Burrell again. 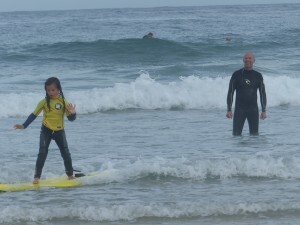 He’s a great team player who is equally well-valued by the Surf School and the Wave Project too! 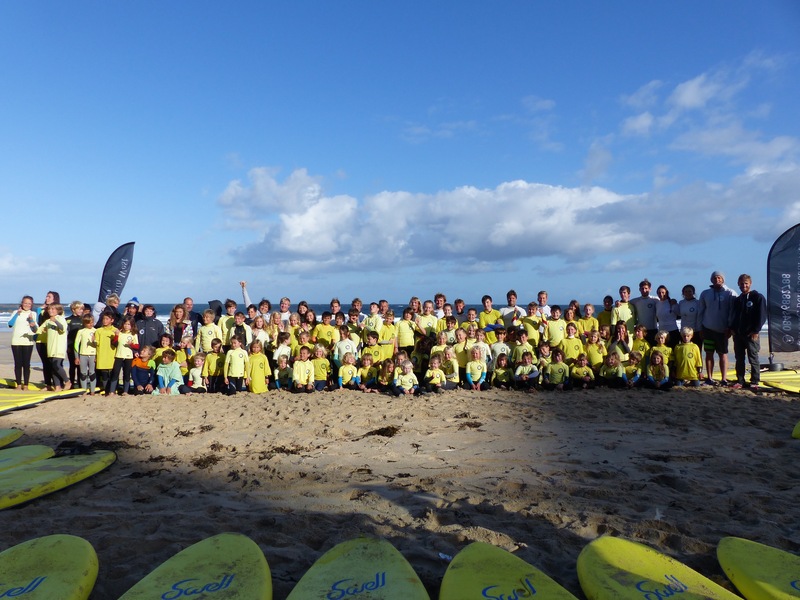 We were honoured to have Britain’s big wave surfing legend Andrew Cotton on hand throughout the event, and having enthusiastically helped the nippers into waves during their sessions, he stepped up to present the major prizes at the closing ceremony. 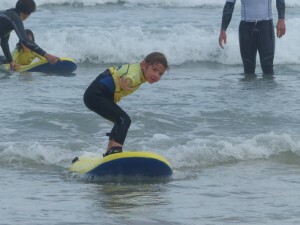 Later that day quite a few parents had the chance to surf with him during his main Porthmeor engagement – a Surf With The Star event on behalf of his sponsors Mercedes Benz. Thanks for your help on our big day Andrew! 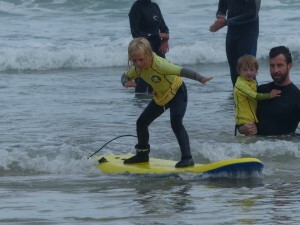 Our thanks are due to our hosts, St. Ives Surf School and to Porthmeor Beach for the competitors’ snack packs. 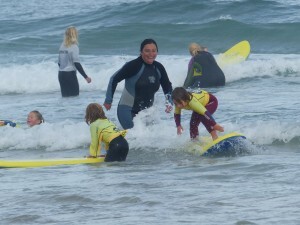 Major support in the form of event prizes came from Laminations Surf Boards, Gul Wetsuits, Robies Robes, Down The Line, West Cornwall Surf Co., Off The Beaten Track, Wind An Sea and Natural Balance. 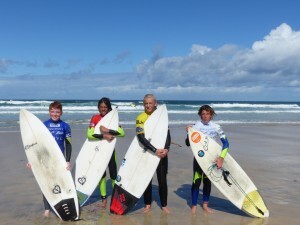 Members please be sure to support these generous businesses when you need surf gear! 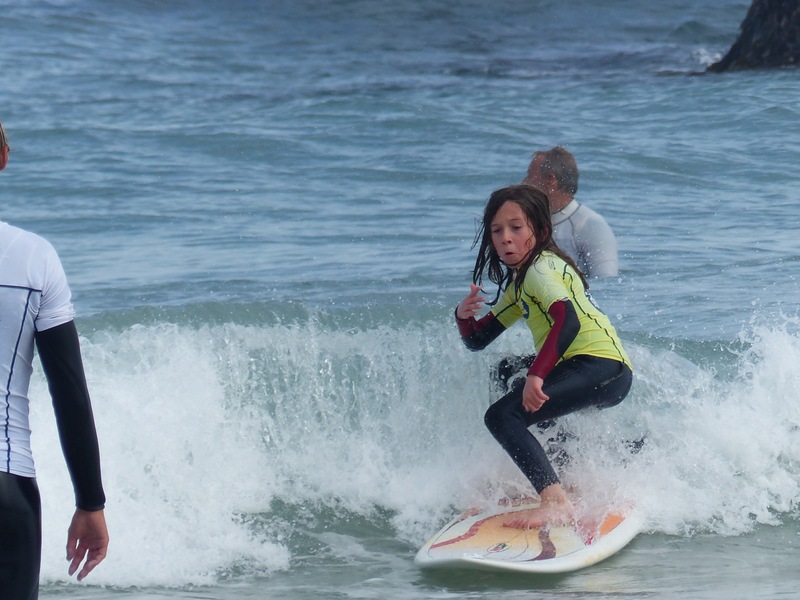 Thanks also to our judges, beach marshalls and check-in crew – and you nippers might want to thank your parents for getting you to the beach every Saturday morning to take part in the club. 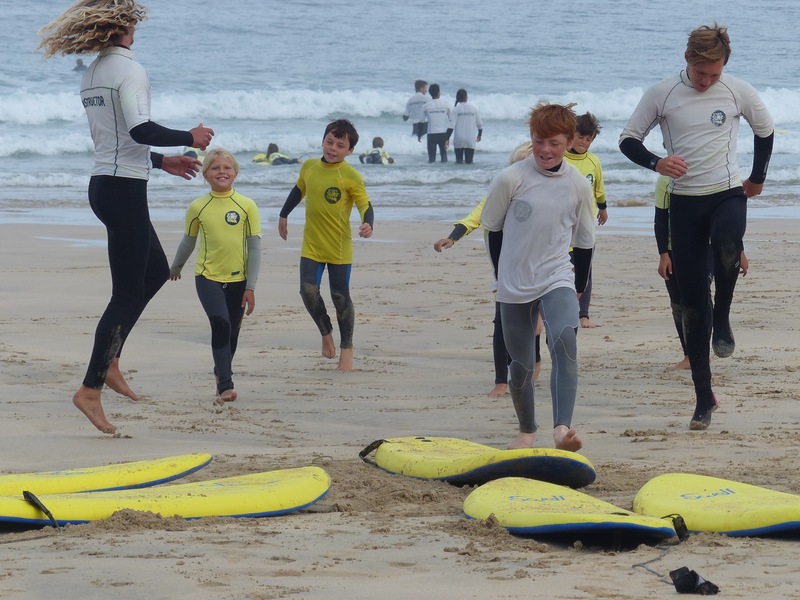 So the summer sessions are over – but in the week that has passed since competition day we have been encouraged by the number of members showing their enthusiasm by getting down to the beach after school and getting in the sea to enjoy their surfing skills. Long may it last. Well, today’s title, borrowed from Nat King Cole’s breezy song, is almost a farewell to Kids Club’s 2015 season. 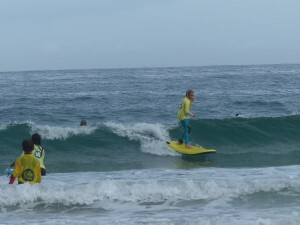 Our last Saturday outing before the end-of-season contest offered some decent surf conditions for our coaches to make a final assessment of how our junior members have progressed this year. We have taken a great deal of pleasure from the Nemos and Dorys, the newest and youngest intake to the club – particularly in having their parents or elder siblings in the water with us giving the sessions a real family feel. 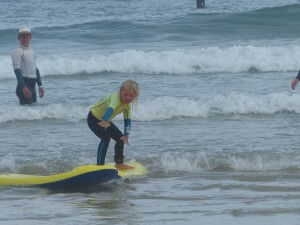 For the older and more experienced groups we’ve structured the fun around the SurfingGB junior surfer scheme, and tried to instill good surfing and safety practice into their time in the water. 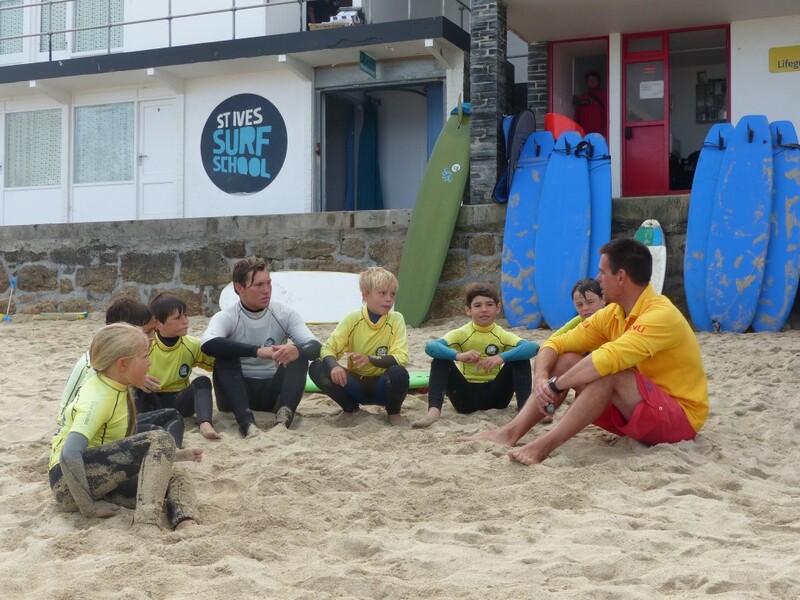 The picture below shows some of the Sardines group with Porthmeor head lifeguard, James Symons, learning that vital knowledge of how to make a phone call to the emergency services should they witness a dangerous situation on the beach. 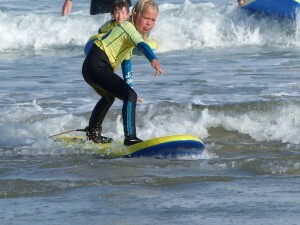 This is one of the fundamental skills required to pass level 3 in the junior surfer scheme. Our two images below show Luca and Matty smashing the close-out to finish a ride in fine style having got as much as the wave offered. That’s what we’re after! So, only the end of season contest remains. I’ve seen some of the kids out polishing their moves during these last few days of the summer holidays. Expect to see the buddhas, cockroaches, coffin rides and ( without giving too much away ) some headstands in the fun shoot out. 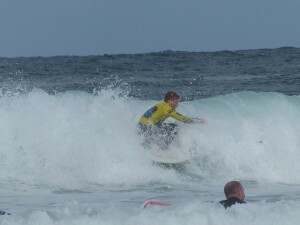 And fingers crossed for some good waves for the senior groups to show what they can do under traditional contest rules. 12th of September it is then !